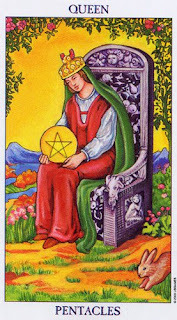 Queens in the tarot, get things done. Toady I’d like to speak about a woman of great power and influence who had a good head on her for finances, health and many other matters. A woman who got things done. Catherine The Great of Russia inherited a mess when her husband, the emperor, died. Russia was a poor and struggling country. A smallpox epidemic in Siberia wiped out some 20,000 people, and Catherine came to believe that reducing its terror would be a great step forward for her people. So at considerable expense she recruited the services of Dr. Thomas Dimsdale of England, the most famous inoculator of the day. Catherine wanted herself and her son to be the first inoculated, to prove to the people that this was a safe and effective procedure. Dimsdale wanted to try his skills with some commoners first, since he was not fully certain that Russian smallpox would behave like the English versions. His attempts were not successful, and Catherine felt that she must take matters into her own hands to establish the credibility of Dimsdale and his work. So on Oct. 12, 1768, she was inoculated. She developed a light case of smallpox but was fully recovered by Oct. 28. And to disprove the popular idea that taking pus from a donor patient would kill that patient, she herself donated pus for inoculation of several members of her court. She and they all survived and inoculation quickly became widely accepted. In taking these steps Catherine The Great did wonders for public health. She enforced inoculations and oversaw the creation of hospital and health care that previously had been reserved only for the nobility. It was under her reign that the common people too could begin to benefit from these systems. She was also very instrumental in creating education for the masses. She felt that her subjects were rather backward at the time, much of it as a result of poor education. Here too she uplifted her people as she enabled them to receive an education that was previously unavailable to them. It is said that Catherine The Great had a great many lovers, and that she was sexually manipulative. Her bed-partners were keen to remain in her favour and therefore made themselves available to further her ambitions towards change for the people. In return, she generously rewarded former lovers for their favours, often maintaining this even after dismissing them. In the period that she ruled, she made changes and really managed to get things done. A great many improvements were made to benefit her subjects, nobility and commoners alike, due to her vision of improvement and even her strategies in achieving these. 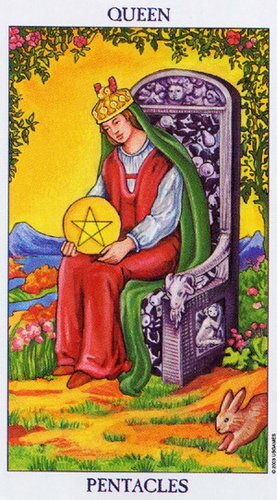 Today this card brings us the following lesson: While there is no harm in enriching ourselves we should always try to find ways to share and help our fellow mankind too. We sometimes make the mistake – however nobly - of donating monies to far-away-charities like feeding children in Africa, for example; however we often fail to notice that our own neighbour, our own people or someone close to us, is starving.